Application Closing Date : 08.08.2018. Applications are invited Online from qualified candidates to the post of Post Graduate Teachers (PGT) & Trained Graduate Teachers (TGT) in Residential Educational Institutions Societies. Sl. No Name of the Post Name of the Society No. of Vacancies Age as on 01/07/2018 Min. Max. Scale of Pay Rs. ii) Pass in Bachelor of Education (B.Ed) course OR 4 years B.A.B.Ed / B.Sc.B.Ed, with atleast 50% marks with the subject concerned as a methodology subject from any institution recognized by the NCTE. iii) Graduation with Language concerned as one of the Optional subjects (OR) Bachelor of Oriental Language (or its equivalent) (OR) Graduation in Literature (OR) Post Graduation in Language concerned from a University recognized by the UGC with at least 50% AND Language Pandit Training Certificate / B.Ed. with Language concerned as one of the Methodologies from any Institution recognized by NCTE, in respect of Language Teachers. Note : 20% of weightage will be given to TET Paper- II score and 80% weightage to the written test conducted by TREI-RB. ii) Bachelor of Education (B.Ed) or B.A.,B.Ed / B.Sc.,B.Ed from any institution recognized by NCTE with the subject concerned as a Methodology subject. 2 Telangana State Government Employees (Employees of TSRTC, Corporations, Municipalities etc. are not eligible). 5 Years based on the length of regular service. 3 Ex-Service men 3 years & length of service rendered in the armed forces. 4 N.C.C. (who have worked as Instructor in N.C.C.) 3 Years & length of service rendered in the N.C.C. Just follow the below steps to apply for the TREI-RB Recruitment Online. Step 1 : The Candidate has to visit the official Website provided above and Click Apply Online tab in the Menu bar. Step 2 : New users please click on the REGISTER button. Step 4 : After entering the details in the Portal, the applicant will proceed to payment gateway. Step 5 : The applicant should pay the prescribed fee as specified through any of the three modes viz. Debit Card, Credit Card and Net Banking. 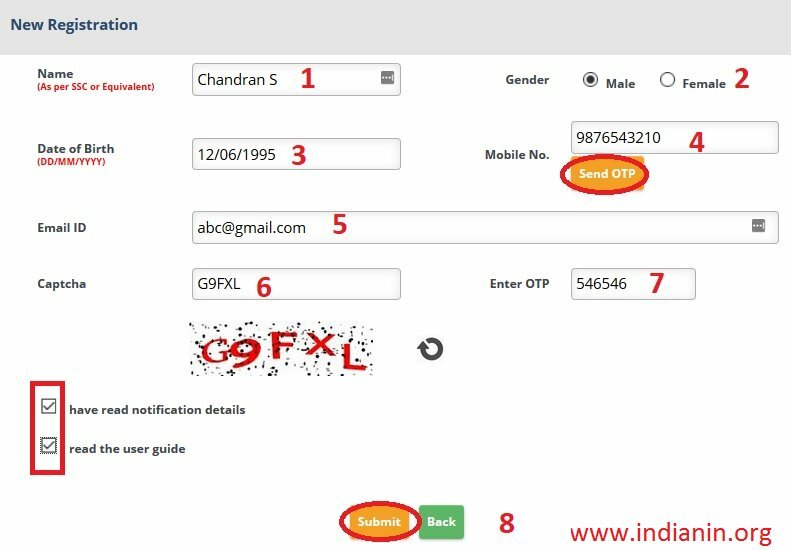 Step 6 : After payment of fee and after filling the entire application form, the PDF Application will be generated which contains the particulars furnished by the candidates. The ID No in the PDF Application form has to be quoted for future reference/correspondence. The following certificates must be kept ready by the candidates for the purpose of verification and also at the time of making online application. iii). Date of Birth Certificate / S.S.C. vi). Local Scheduled Area Certificate (ST Candidates hailing from Agency Area) wherever applicable. vii). Other certificates if any. The examinations will be held at HYDERABAD (including HMDA Jurisdiction) only or all erstwhile District head quarters. However, the Board reserves the right to either increase or decrease the number of Centers. i) For any Technical problems related to Online submission and downloading of Hall- Tickets please contact 7032619292 (Call Time: 10.30 A.M to 1.00 P.M & 1.30 P.M to 5.30 P.M) or mail to helpline.treirb [AT] gmail.com. ii) For any General Queries please contact office of the TREI-RB Phone No.040- 23317140 or 040-23317130 (Call Time: 10.30 A.M to 1.00 P.M & 1.30 P.M to 5.30 P.M) or mail to helpdesk-treirb [AT] telangana.gov.in.